The TI-84 Plus Keypad is more than just a replacement of the original TI-Nspire Keypad. It emulates the keystrokes and functionality of the previous TI-83 Plus, TI-84 Plus and TI-84 Plus Silver Edition graphing calculators. This allows the use of the TI-Nspire on exams permitting just the TI-83 Plus based calculators like SAT and ACT. 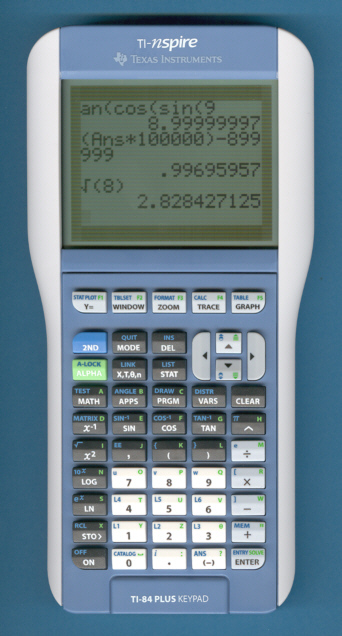 The TI-84 Plus Keypad supports with its integrated connector the TI-Navigator™ system, the TI Connect software and the 2nd-generation CBL 2™ (Calculator-Based Laboratory) and CBR 2™ (Calculator-Based Ranger). Since the TI-Nspire with TI-84 Plus Keypad lacks a QWERTY keyboard it is permitted (as of September 27, 2007) for use on SAT, ACT, PSAT and AP exams.